The pharaoh changed his mind about letting his slaves go, so he sent an army to capture the Israelites. He caught up with them at the Red Sea shore. But God pushed back the waters and made a path on dry land. The Israelites passed through the walls of water to the other side, but when the Egyptians tried to come through, God caused the walls of sea water to fall on them. The Egyptians drowned, but God's people were saved. As the Israelites traveled through the desert, they began to complain about their food. So God sent food from heaven. 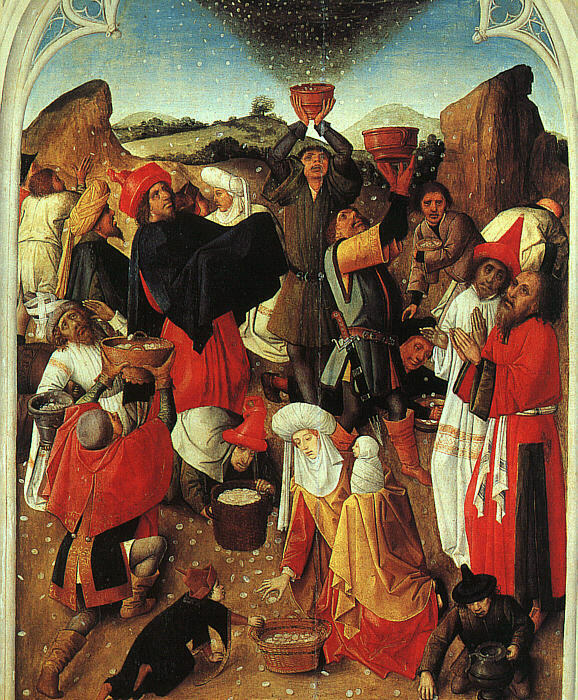 In the morning he sent sweet flakes of bread called "manna". Each day the people gathered only enough food for that one day. God sent new food every day. * When they asked for meat, quail covered their camp and they were able to catch the birds for food. The Israelites once camped at a place where there was no water. They complained to Moses. The people and the cattle were very thirsty. Moses asked God what to do, and God told him to take his walking stick and hit the rock. * When Moses did this, lots of cool water poured from the rock! The people had all they wanted. * On the Sabbath day there was no manna. God told them to pick up twice as much on Friday and bake it because there was to be no work on the Sabbath. The bread they baked on Friday did not spoil and they could eat it on the Sabbath. * On another occasion God told Moses to speak to the rock, but Moses in anger struck the rock. Water came forth for the people to drink, but God was not pleased because Moses had disobeyed, and he later suffered the consequences of his disobedience. He was not permitted to enter into the land of Canaan with his people, and Joshua became their leader at that point. Moses led the Israelites out of Egypt. What a huge responsibility! God provided the things they needed for the trip, including providing dry land so 2 million people could walk across the Red Sea. He provided so many miracles for the people, but all they could seem to do was complain. We are so blessed because God provides the things that we need. Do you take your blessings for granted, or do you remember to thank God for the great things He has done for you? Do you complain if things don't go your way? Try remembering that God made a great sacrifice for us and all he wants from us in return is a faithful Christian. This story about the Exodus can be found in the Bible in Exodus, chapters 14-16. 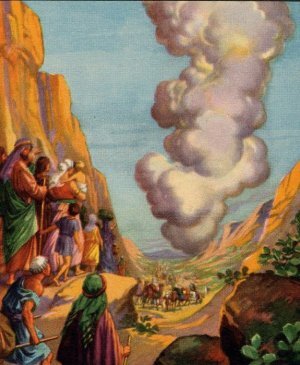 English Bible Activities Select stories #36-42 in the list for activities to accompany this Bible story. Spanish Bible Activities Select stories #36-42 in the list for activities to accompany this Bible story. Press "Go" to search for books about The Exodus. Thank you so much for your hard work! Is there a bible lesson that deals mainly with prayer? I am in need of one. Thanks again! This page displayed 213,432 times.